« Here is the finished afghan from my stash of pink and white yarns…..I think it turned out cute! 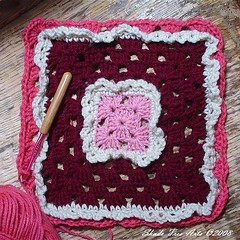 This is kinda like a granny square, only a bit different. It’s the beginnings of the Round the Block afghan from the book 24-Hour Crochet Projects. Instead of making a lot of smaller squares, the square on this one will only get bigger until it becomes a 50x50ish-sized blanket. I love the ruffles, and right now, I love the shades of pink, but that will change. I’m stash-busting as I do this project, using up worsted weight yarn in my stash that has no particular purpose. I’ve made this afghan once before and really liked the results. I think sometime I may actually make one in just the pink/reddish hues, but it’ll have to be at a time I’m not trying to use up yarns I already have. Will post the finished project when it’s done! It is just beautiful. I can’t wait to see the final post when it is done.